Ok Guys! As I mentioned before, there are going to be some changes to my week of hosting BSI event, so here they are. There was some miscommunication regarding the hosting of the 89th week’s event and as a result two people hosted week 89. There after two parallel threads of the same event were going on. This problem was discovered during my week of hosting. We had stop this from continuing and for that I had a lot of discussion with the immediate previous hosts. The conclusion was that I will continue to host this week and my week will be 92nd week of this event. I have updated the list of previous hosts below to accommodate everyone and also the last date of submission for my week. The story behind this event is that each week the chosen host will pick up an ingredient of his/her choice which has not been chosen as BSI before. To participate in this event you need to send recipes using the chosen ingredients and at the end of the week the host announces the winner and passes on the event to the next host. Now time for the surprise. I am really happy to announce that I have received a sponsorship from CSN Store’s Dutch Oven for the winner of this week’s BSI-Event. The prize is a gift certificate of US $35. This gift certificates can be used in CSN Stores US/Canada and if the winner is from UK then an equivalent amount of gift certificate will be given which can be used on CSN Stores UK online stores. There is a huge range of products to choose from. My apologies if the final winner is not from US, UK or Canada, but I am sure the recognition of being a BSI winner is a reward by itself! So gear up and send me your entries. This week's ingredient is Pistachio. * Main or one of the main ingredients of your recipe should be Pistachio. * Anyone can participate, you don't need to have a food blog to participate in this event. * If you have an archived recipe then please send me the link. * Please send your entries at (easy2cookrecipe [at] gmail [dot] com). * Alternatively you can also leave a comment on this post. * Last date to send entries 29th August 10pm GMT. I will announce the winner on Sunday 29th August also the name of the next host who would like to host the 93rd Week. Coconut always reminds me of festive sessions in India. I can't think of one festival where I have not seen coconut being used. In India any puja, festival or any auspicious ceremony will not be completed without coconut. I was pleasantly surprised to know that there is a festival in Maharastra which is named after this tropical fruit. It's called the "Narali Purnima" which is celebrated during the month of Shravan (August) by the fishermen. I made these pancakes quite some time ago but never really got a chance to upload them. This week I was going through my list of unpublished recipes and found this one. Although I have uploaded the photos on my Facebook page but the recipe was not uploaded. Back in India we used to relish on this dish during Makar Sankaranti around end of January. The dish is called Patishapta in Bengali. I have made little changes to the original recipe. 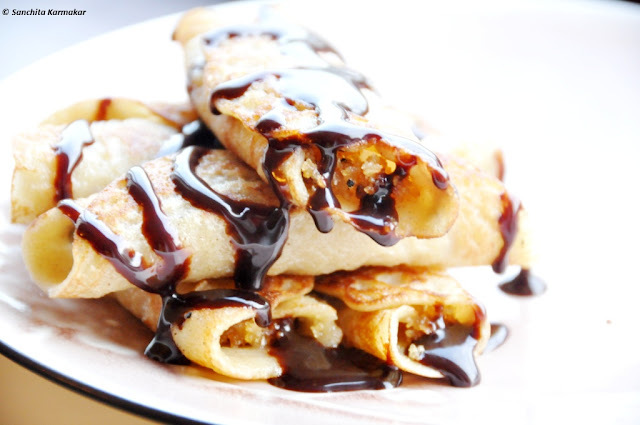 So here is the recipe of Patishapta with chocolate sauce. Mix all the dry ingredients for the pancake, then add the milk and mix well until it becomes a thick homogeneous mixture. Keep it aside. In a deep bottom pan mix the coconut, sugar, maple syrup and honey until the sugar has melt and the whole thing has become sticky. Crush the green cardamom seeds and mix in the coconut mixture well. Break the chocolate in to pieces and place them with the butter and sugar in a Bain-marie and let it melt till it becomes a pool of chocolate. Add the double cream and the vanilla essence; mix well with a wooden spoon. Remove from the water bath and let it cool. Heat oil in a non-stick pan, add spoon full of pancake batter and spread with the spoon. Cook till bubble forms on the top. 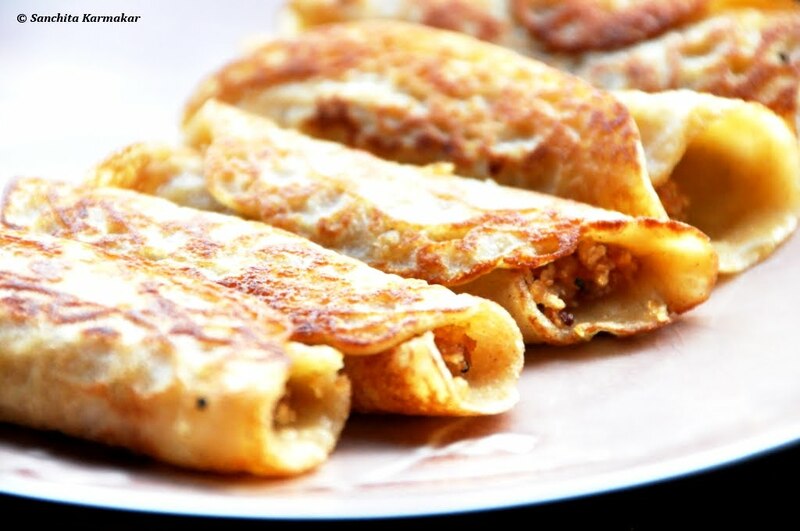 Place the coconut mix on one side of the pancake and roll the pancake and keep for a minute and remove from the pan.Repeat the procedure for every pancake you make. 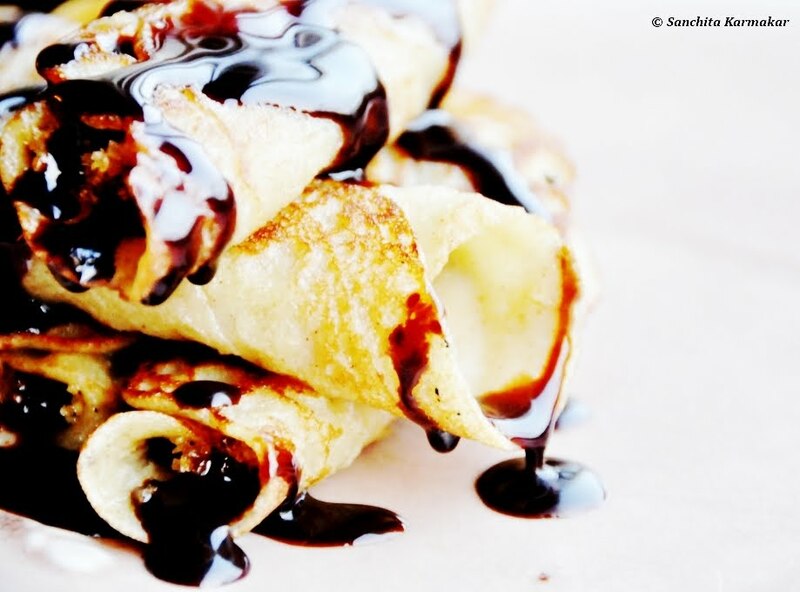 Serve hot with the hot fudge sauce.